linked image to full-sized view. I grabbed the textures from MEDIA/WARDROBE/_LVLS11_20/FURHIDE_01 and copied them to my project under MEDIA/WARDROBE/FURHIDE_DRUID, except the mesh and skeleton files. I edited them and changed their hue to be a nice forest green. I changed the MATERIALs files so they referenced the new FURHIDE_DRUID files — in those MATERIAL files, references to the HU_FURHIDE_DRUID_EXTRA file was to type PNG instead of type DDS. So I resaved the actual DDS file as a PNG so both versions were available in the folder. Note that I am working with a class that originally was tuned to use the furhide_01 set, and that already worked perfectly. So it already had overrides in there and I am just preferring my own recoloring. So it all works. They are all showing up. But obviously some of the textures are the wrong color still, and that isnt true in the files i provided. what's causing this issue with the furhide_01 set? media/wardrobe/_lvls11_20/furhide_01_druid and copy all the necessary files. Just create a new folder, copy all wardrobe files and add your own textures. Where I have B - Blue, D-dark, C - crimson, E-yellow. All wardrobes which have different colors and extra texture should be on individual folders. Wait the MATERIAL files are just plain text files. I already changed them. Do you mean the mesh files? How do I change those? update: I am looking at the model in blender! I feel so proud. I think you have changed is not all that necessary. Change the color texture - is simply, I do not know why it does not work. edit: tested in game. it works without conflict! so skip this question. If I leave the name of a texture the same, but change the directory it is found in, will it leave the original items alone? 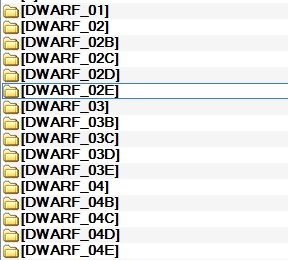 like, the files I am working with are from WARDROBES/LVLS11_20/FURHIDE_01, but in my mod they are in WARDROBES/FURHIDE_DRUID — so will a file in that directory in my mod named HU_FURHIDE_01_BOOTS.DDS overwrite the texture of the same name in the main wardrobes? It looks like all I have to do is rename my DDS textures back to their original names, but I was afraid of changing the default textures in the process —it's why I renamed them in the first place. Hi Robisinho. If you're going to use a custom wardrobe folder then it has to contain the appropriate .MESH file for that particular armor piece, because the .MATERIAL file will only apply itself to a .MESH that's in the same folder that it's in. I think this is kind of waht Kva was trying to say also (not that you'd need to fiddle with the .MESH itself for assigning textures ).